October 22, 2015 – BAE Systems and Integrated Device Technology, Inc. today announced a new technology for space applications that will transfer greater volumes of data at higher speeds than ever before possible during space missions. BAE Systems’ new space-grade microchip, known as the RADNET1848-PS space-grade RapidIO switch, will use the market’s first RapidIO interconnect to speed massive amounts of data through a network of radiation-hardened computer systems in outer space. BAE Systems selected IDT’s 240 Gbps CPS-1848 RapidIO switch as the foundation for its RADNET1848-PS product. 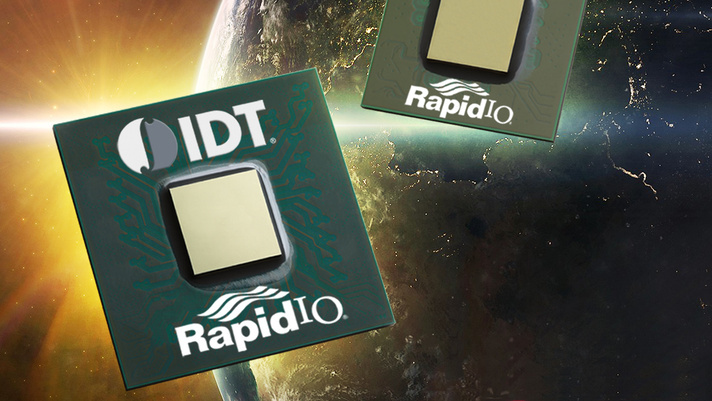 IDT’s RapidIO chip, used to connect computer system components, delivers high reliability at ultra-high speeds. It delivers superior performance per watt, low latency and deterministic packet delivery to enable reliable, fault-tolerant systems. These space-grade solutions are resilient to — and can work within — the ionizing/radiation-intensive environments of space. BAE Systems’ new rad-hard RapidIO switch is now available for sale to the space and military communities. BAE Systems and IDT have been working with other leading technology companies to develop products for use in space. With the new RADNET1848-PS space-grade RapidIO switch, system architectures can now build upon this new backbone data interconnect. The concept of the new RapidIO switch began in 2012, when the selection team of the Next Generation Space Interconnect Standard (NGSIS) chose the RapidIO protocol as the technology of choice for digital data transport, selecting it over Ethernet, Infiniband and PCIe interconnect. The NGSIS, a government-industry collaboration, had been charged with defining a set of standards for interconnects between space system components. The standards, collectively known as SpaceVPX, are intended to promote interoperability so that users can cost effectively develop computer systems for use in space.